Beef short ribs simmered in a savory sauce all day then piled high on sweet Hawaiian rolls. 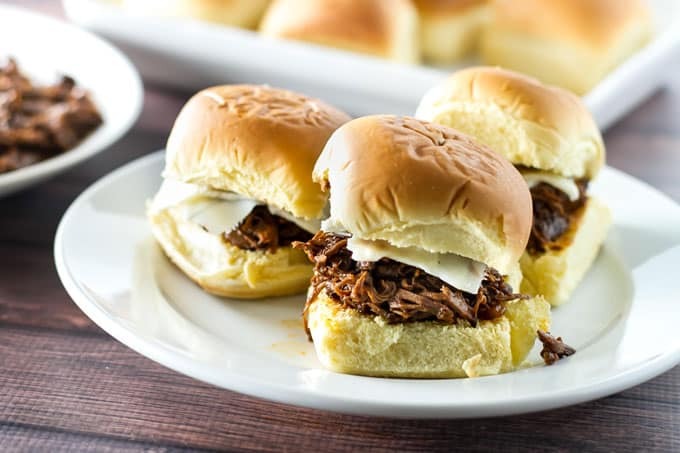 These slow cooker short rib sliders are a game-day favorite! I’ve said it before and I’ll say it again: food is the best thing about football season. As a girl without a team or a care, really, about who wins or loses (my Broncos-loving family will have my neck for even writing that), I’m not the one hanging around the water cooler reliving the previous day’s game with fellow co-workers. I am, however, an avid food fan so if there’s a spread of tasty bites at a game-day get together I am so there – chips, dips, wings, pizza, and burgers – game-day eats and treats are what I care about and I will show up and cheer if it means I get to eat. The best game-day eats are ones that are easily assembled and eaten whether you’re parked on the couch or standing around because all the seats are taken. 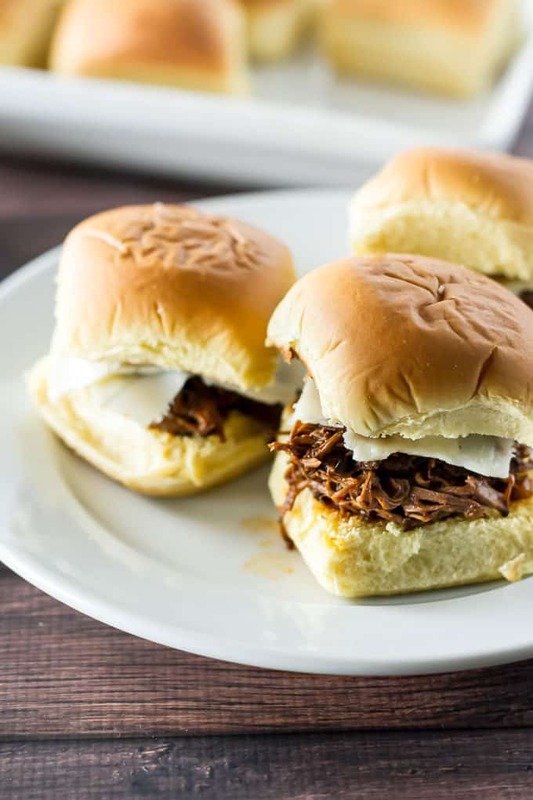 These short rib sliders are perfect for that – compact and easy to eat. 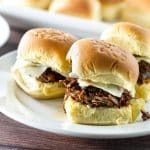 Tender, fall-apart shredded short ribs piled on toasted sweet Hawaiian rolls and topped with provolone cheese – they’re simple but so full of flavor and, I can promise, they will be a huge hit if you have any plans for a game-day gathering at your house. The best part? We get to use the slow-cooker! You’ll need 2o minutes of prep time to brown the short ribs and veggies before they go in slow-cooker. The prep time is so important, so don’t skip it and chuck all of the ingredients in the slow cooker. You’ll get so much more flavor, so it’s worth the small effort. Once you’re ready to serve them let folks build their own – I kept ours simple with just a few thin slices of provolone cheese to top them off but feel free to pile on whatever toppings make you happy. The choice is yours! Beef short ribs simmered in a savory sauce all day then piled high on sweet Hawaiian rolls. 2 pounds boneless short ribs, seasoned on all sides with salt and pepper. First heat the olive oil over medium high heat. Add the short ribs and let them cook until they are nicely browned on one side. Flip them over and brown them on the other side. Remove them from the pan and set aside. Add the carrots, celery, onion, and garlic to the pan. Cook all of the veggies until softened. Add in the fennel seed and chopped parsely and give everything a stir. Transfer all of the veggies a slow-cooker. Place the short ribs on top of the veggies (also pour in any juice on the plate). Add the beef broth, tomatoes, balsamic vinegar, and molasses. Stir it all together, cover it with the lid, and let it cook on low for 8-10 hours. Carefully remove the short ribs from the slow cooker and set them on a plate. Using two forks, shred the beef and then return it to the slow cooker. Stir everything together, give it a taste and check for seasoning. Add additional salt and pepper, if needed. Replace the lid to keep all of it warm. Turn the oven to broil. Slice the rolls in half and place them cut side up on a baking sheet. 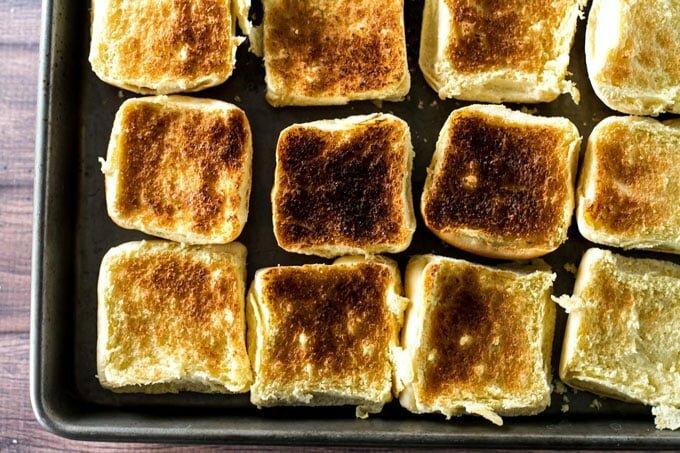 Toast them under the broiler for a few minutes until they turn a nice golden brown. Using a vegetable peeler, slice off thin slices of the provolone cheese. 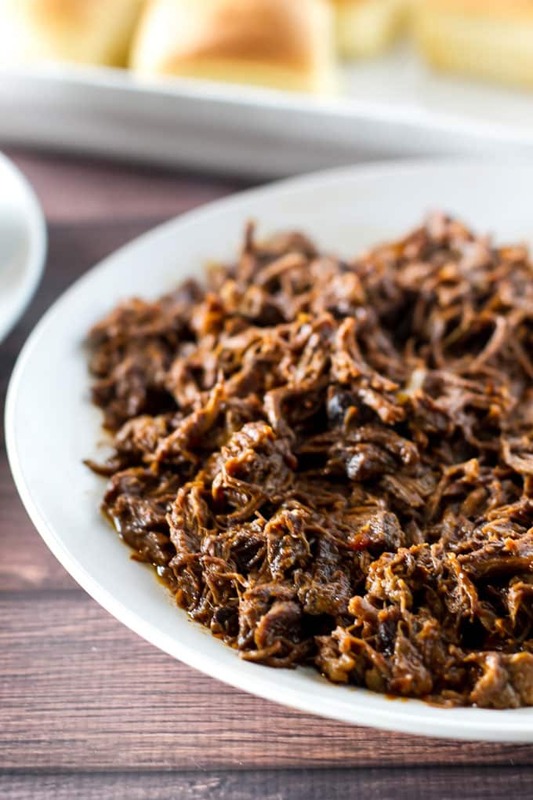 Scoop some of the shredded short ribs onto a roll. Top with a few slices of provolone cheese and serve. Nutrition estimate does not include the slider buns. Does this amount of meat make enough for 12 sliders? Depending on how much you want to pile on the buns, there should be plenty for 12 sliders, if not more. I love short rib anything! These look really good! I’ll be coming back! I just started using mine again and have to say I’m loving it! What a great use of one of mankind’s best friends, the trusty slow cooker! I’d give almost anything to have one of these sliders in front of me right this minute! I have to agree! I’ve always been an oven girl for braising, but I’m warming up to the slow cooker now – especially after making these. Turned out so good! Love using slow cookers….everything always turns out awesome…and it feels like you didn’t even do any work. These sliders sound yummy!! That slow cooked beer looks SO delicious. I just love recipes like this. I like to throw some pickled onions into the mix as well.